Adam and his family live on a small island where they enjoy hiking and hanging out by the sea shore together. In addition, Adam is a licensed pilot, so you can often spot him spending his free time flying small planes. With a background in engineering and mathematics, Adam works on applying engineering and physics principles to living systems. He uses lessons from the natural world to develop solutions to real-world problems like how to filter things, stick to things, burrow in sand, and move quickly and efficiently under water. Adam is insatiably curious about how things work. Curiosity and the opportunity to learn new things are highly motivating forces. Growing up, Adam spent his summers living in a remote lakeside cabin without running water or electricity. There he was completely surrounded by nature and animals. During the rest of the year, he lived in downtown Manhattan where he found ways to appreciate wildlife even in an urban setting. Adam didn’t realize he could have a career studying animals, so he pursued math and engineering in college, but the career options in these fields didn’t appeal to him. After college, Adam spent time as a SCUBA instructor in Australia. While there, he rediscovered his love of the natural world, met research scientists, and realized his interest in returning to school for a graduate degree in biology. A recent project in the lab was stopped in its tracks due to the failure of a critical piece of equipment. He and a student were trying to figure out how much force is required for a particular fish to knock a particular mollusk off of a rock when the specialized force transducer they were using stopped working. This put the brakes on the study, and the student had to switch to a different project. Adam experienced a transcendent ah-ha moment working while investigating how well fish stick to different surfaces. He was struggling with perplexing results suggesting fish stuck equally well to surfaces with different levels of roughness, but didn’t stick as well to smooth surfaces. This didn’t make sense based on his understanding of how a suction cup should work and how suction cups fail. He realized then that fish use a different mode of sticking than the traditional man-made suction cup and thus they failed in a different way. This explained the results they had seen experimentally. Adam will always remember his trip to the Rivillagigedo Islands, a small volcanic island archipelago 270 miles off the coast near Cabo San Lucas. These islands were recently designated World Heritage Site, and it is one of the few places where you can interact with giant manta rays. Adam visited the islands to study how manta rays filter particles that are smaller than the filter holes in their gill rakers. There Adam completed one of the most challenging recreational dives in his life. The water was very deep, and he was surrounded by hundreds of large marine animals, including mantas, sharks, and dolphins. Adam recalls midnight strolls in graduate school through the basement fish collections where there were tens of thousands of fishes in bottles of ethanol. Guided by the light of his tiny flashlight he would gaze, enchanted, at the amazing variety of fishes. In Adam’s lab now, they have a 3D printer that is used to print samples of fish. He prints about 40-50 anatomically correct fish specimens per year that have a habit of mysteriously disappearing from the lab, likely ending up as souvenirs of students and visitors. As a faculty member, you should find a way to make your teaching serve your research. Teaching can take a lot of your time, so make sure to leverage it to also further your own knowledge. In addition, it is important to go out of your way to be kind and listen to your colleagues and students. If you do, everyone will benefit. Adam was raised in New York City and the north woods of Canada. At Swarthmore College he earned degrees in mathematics and engineering, but was not interesting in pursuing either as a career. While teaching SCUBA in Australia on the Great Barrier Reef he met his first professional biologists. He returned home to pursue graduate degrees in biology. From the beginning of his research career, Adam attempted to capitalize on previous training as an engineer to understand the evolution of the mechanical systems of animals. At the University of California, Berkeley he worked on the mechanics of salamander walking and the jaws of a particularly unusual group of limbless amphibians called caecilians. While at UCB he was approached by Pixar Studios to help with the movie “Finding Nemo”. He spent three years advising on animal movements and biological aspects of the film and was delighted when the hard work of the Pixar folks was so well received at the box office. In 2001 Adam founded the Biomechanics Laboratory at the University of California, Irvine. In 2009 he moved his laboratory to the University of Washington’s Friday Harbor Laboratories where he assumed the role of Associate Director. 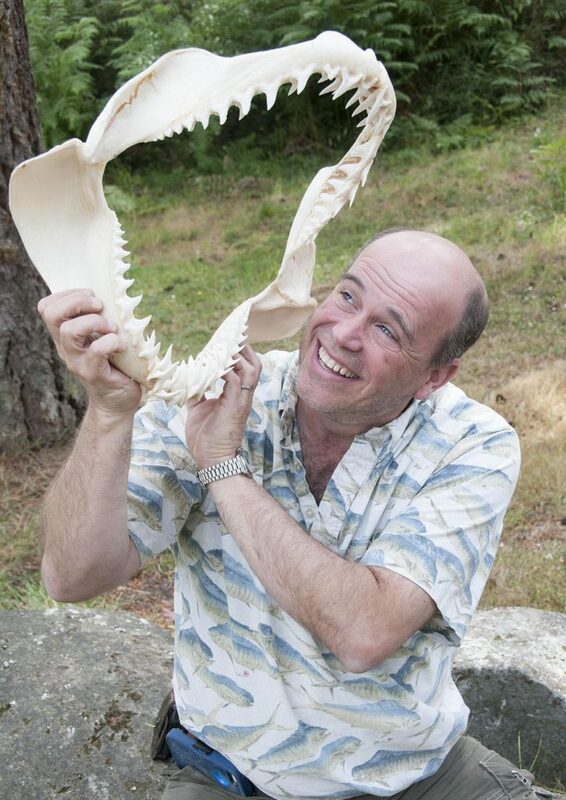 With students and collaborators he has published more than 70 articles in scientific journals on topics including the heads of hammerhead sharks, the properties of skeletons and difficulties of eating hard prey. He also enjoys sharing his enthusiasm for biomechanics with a monthly column in Natural History Magazine. Adam continues to teach an intensive graduate course in the biomechanics of fishes at FHL, and he is also prospecting for new classes of biomaterials from the sea.